Will returning dual citizens and Canadians disaffected by the Trump presidency buoy up prices? Gratefully, Trump's acceptance speech did not start with a "lock her up" chant and it might be that he puts his most crazy thoughts back in storage for four years. There are certainly many who have said they would move home in the event of a Trump win but I suspect that human lethargy will prevail and that the impact on the real estate market here will be minimal. There may well be more ridged policy implemented around NAFTA visa processing for Canadians but this will take time if it happens at all. 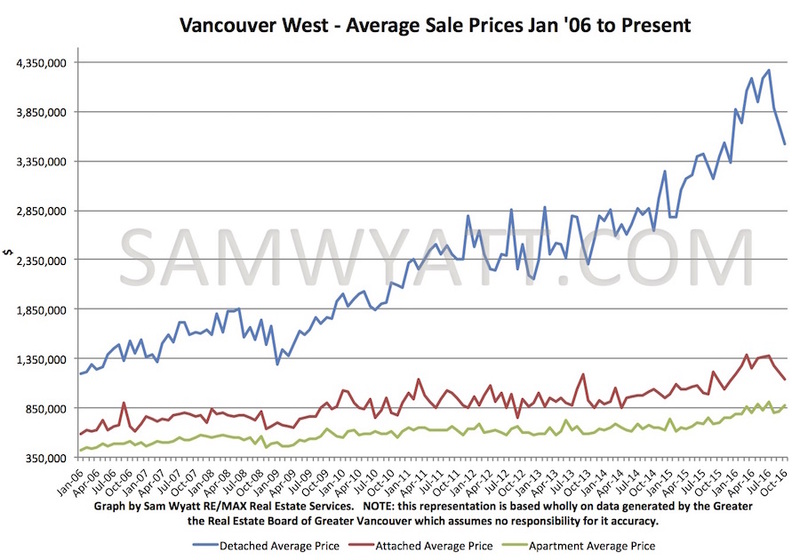 Months of Inventory (MOI) fell for detached Westside Vancouver homes but continued to climb for attached homes and apartments in October. 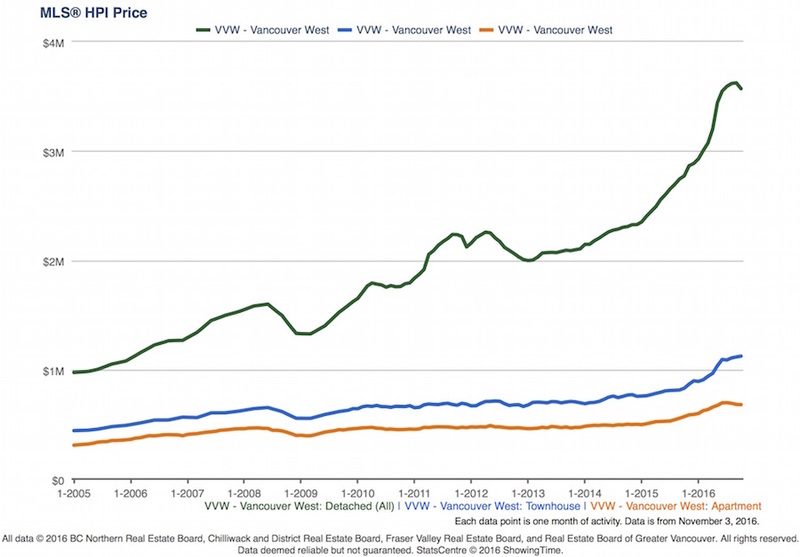 Detached homes stepped back from "Buyer's market" territory. 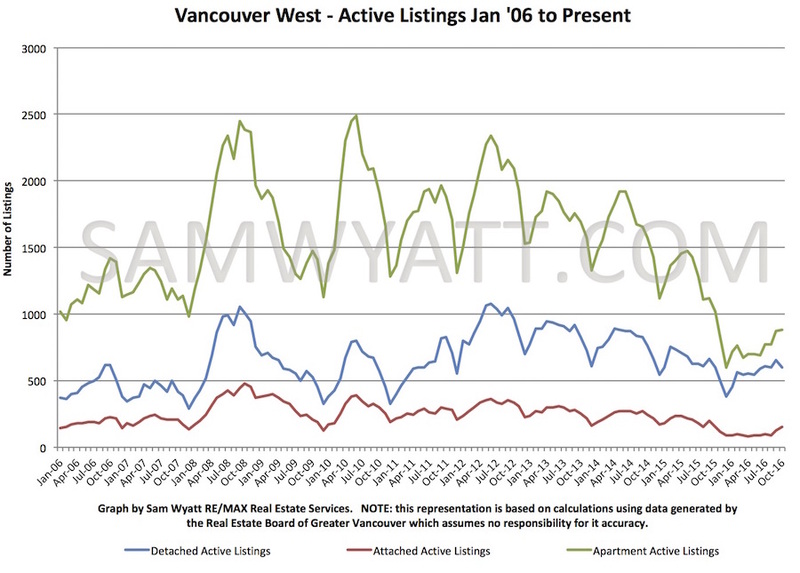 Detached and attached homes are presently in a "balanced market" while apartments remain still in a "seller's market". Sales volumes increased slightly in October for detached homes but continued to fall for attached homes and apartments. 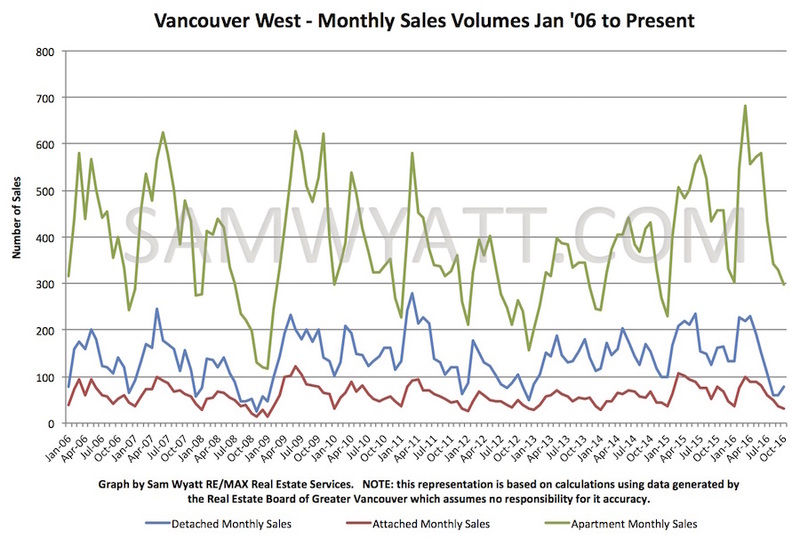 If history tells us anything it is that sales volumes will probably fall for all homes types in November and December. October active listings grew for apartments and attached homes but fell for houses. 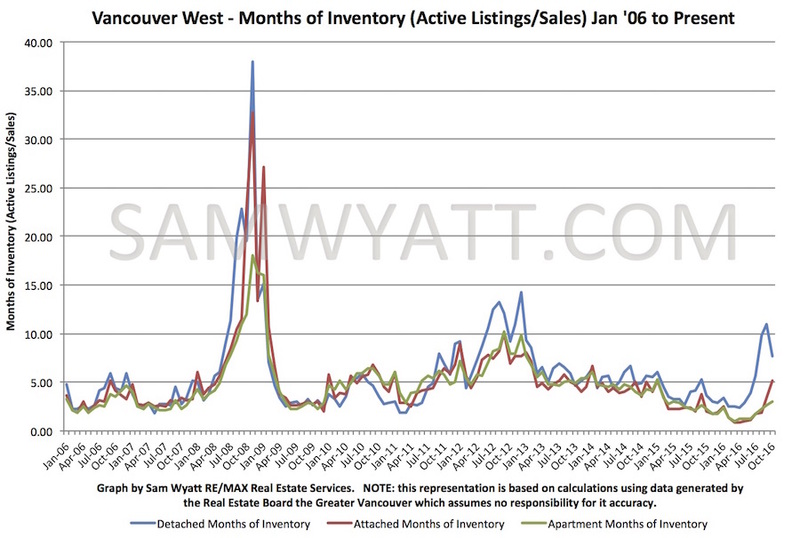 Like sales volumes, we can anticipate active listing volumes to fall over the coming months. The quick rise in MOI in August and September helped precipitate a significant drop in average sale price (from $4.269m in July down to $3.517m in October) and a modest decline in the HPI index for detached homes. 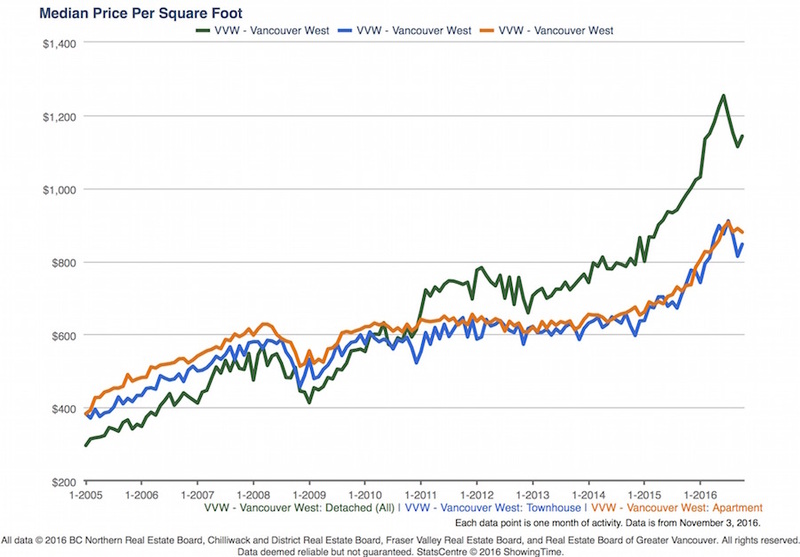 A slight uptick in median price per square foot for detached homes in October may indicate that house prices may be on their way to stabilizing. I suspect that the market will continue to wind down into January. It remains to be seen what will happen in the Spring market of 2017. Presently I believe that we will see modest price rebounds and a more subdued pace then we have had in 2016.